This listed irrefutable (tested, documented, and blatantly obvious to anyone with sight and reason) evidence, even when asked, was not presented by the first, nor three more so-called juvenile, Utah "Family Law" Defense??? lawyers! -- Why??? -- But! -- when finally submitted by our fifth lawyer, all was firmly objected-to & refused by PCMC, DCFS & the Attorney Generals Office, and was never acknowledged nor considered by Judge Kathleen M Nelson in her final ruling against this family's freedom of medical service, only PCMC!!! or any second opinion, and against their proven healthiest lifestyle choices! She ruled nothing about a bad furnace! -- Then immediately recused herself from any more function in this case! And now substitute Judge Stanton M Taylor refused our good attorneys motion for retrial on the real evidence -- directly affecting the safety of "conditionally returned" baby Matthew, the other young sibling sisters and their parents! Now the Attorney General has threatened our good attorney with reprisal for presenting these above truths! Tell us Why? 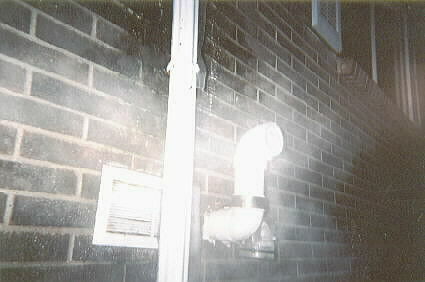 These winter photos show the furnace exhaust mushroomed by the evening through morning prevailing breeze! 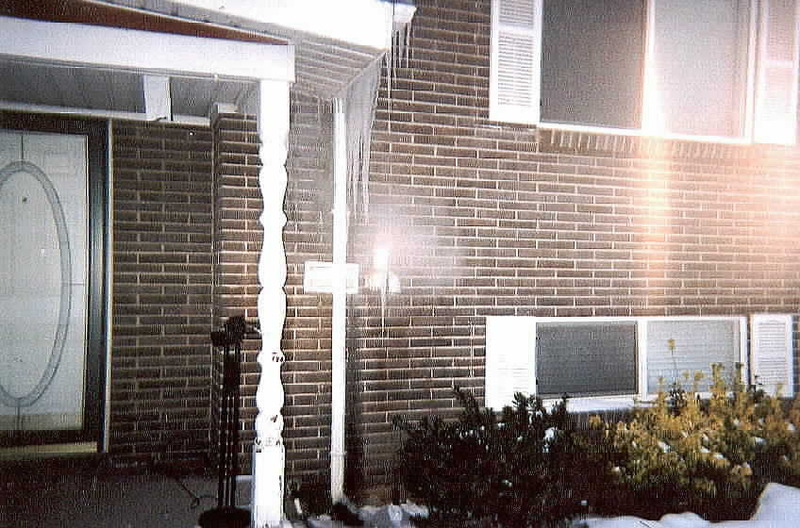 This furnace exhaust outlet (mistaken by this untrained family and friends as a dryer vent) was in place when this trusting young couple purchased the home - as show with red arrow in the Realtors photo above! - It is low in an east facing front wall below bedroom window, close to basement family room /playroom, front door & living room windows! And is also trapped by porch & roof overhang! 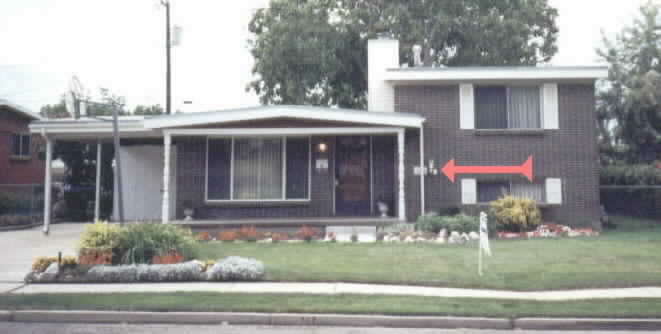 But (which should be and is obvious to any good, honorable and clear thinking professional) the most endangering in this exhaust arrangement is the less than 12 inches that measures between the furnace exhaust and the only fresh air (gravity flow) intake - the square vent (behind roof drain) - with the prevailing nightly East wind forcing exhaust into the whole house. Only supply of air to closed-up house! Juvenile Court Judge Kathleen M Nelson (who recused herself) & Stanton M Taylor (who denied retrial with this correcting and exonerating evidence that any stupid man understands! 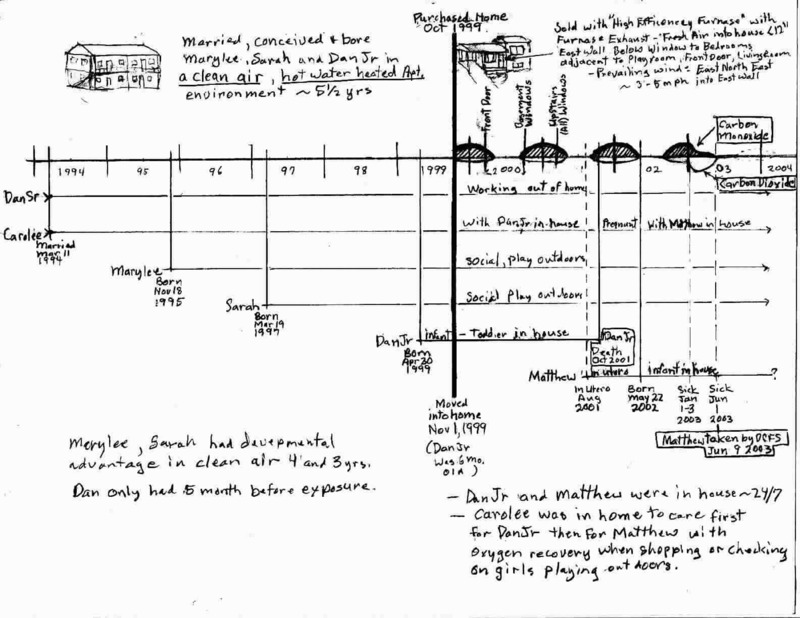 -- The correctly identified cause of death for Dan Jr? or its connection with his sickened infant brother that they ignorantly abducted and misdiagnosed? -- or covering their own bungled investigation, vile vegetarian-hate triggered mis-diagnosis and mis-treatments and their vicious (nursing) infant separation trauma (damage and tremors) which they ineptly foisted upon an asphyxiation and infection struggling baby Matthew, his loving mother, father, two little sisters and supporting maternal grandparents??? Get the answers and the truth on this case. then act to right this awful miscarriage of justice! Including challenging your Congressmen, Legislators, our Governor, the AG and all candidates! -- DCFS, The Medical Examiner and PCMC! -- If we don't get this corrected, you, your children or your friends may be next to be violated in this prejudice, ignorance, malfeasance & pathetic medical and bureaucratic unprofessionalism! Please See, Print, Staple and Share these pages (as fliers)! 1. Flier: Babies Breathing Furnace Fumes OK for Government! 3. Police Report Circa Dan Jr's. Death: CO Alarm Recorded! & Ignored in Post-mortem!